Update September 26: Boards are in! I sent out PMs to everbody on the list. I don't have the SMD resistors yet, so if you need presoldered boards you will have to wait a bit longer, sorry. Update September 15: Prototype boards are in, Build Doc (beta) is online. I will order boards later this day. If you haven't made your order yet, please do it now so I can estimate the number of boards needed. I had a few patch cables failing on me in the past and I thought it would be nice to have a small circuit to test them. 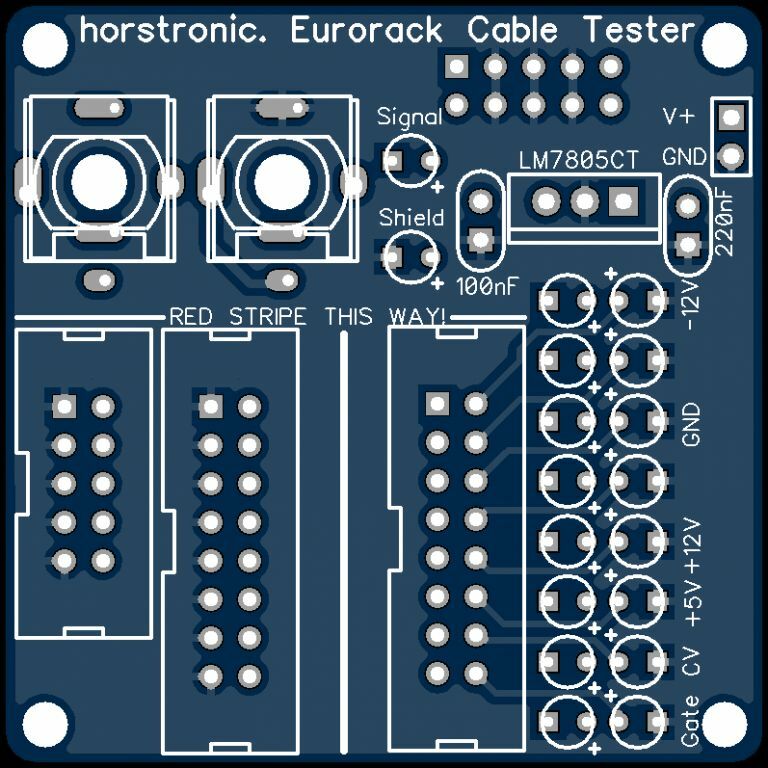 I'm doing my own eurorack power cables so it would also be nice if I could easily check them, too. It's two cable testers in one. You can check patch cables and power cables (10-pin as well as 16-pin). There's an LED for each line, so that's two for the patch cables and 16 for the power cables. If there's continuity between the right pins, the particular LED lights up. 16 LEDs for the power cables means that you can check each line individually, in case there are single broken cables in the ribbon. Of course you wouldn't notice that if you plug it in, because the module would work anyway but if you have one broken cable on +12V for example, that would double the resistance. We don't want that, so that's why this is checking each line individually. Also the polarity of the LEDs is inverted on every second pin so you can see if there's a short between cables or if the ribbon is the wrong way around. This also shows you when you have the ribbon shifted one pin on a 16-pin to 10-pin cable, which also happend to me a few times. There are 18 0805 SMD resistors on the back of the board as series resistors for the LEDs. The whole circuit can be powered either by your eurorack PSU (there's a dedicated 10-pin connector for that on the back of the board, to make sure the cable doesn't get in the way of the cables you're testing) or any other voltage source between about 7.5V and 15V. If you want to use higher voltages, I would add a heatsink on the voltage regulator. I'm using a Mutable Instruments Module Tester, which works great. I'm just leaving this information here, in case anybody is interested in a PCB. 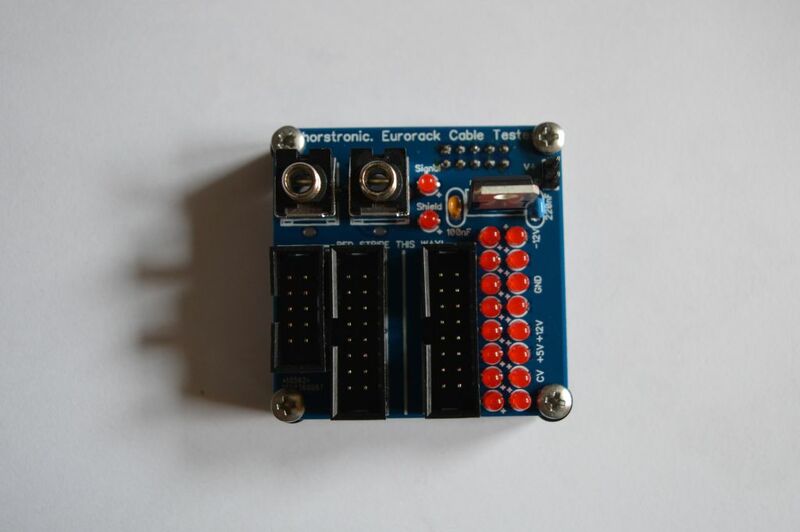 I have ordered a few prototype boards already so I could sell my spares, assuming that it all works as expected. If there's more interest, I could do a bigger run of PCBs later. I'm also open for any suggestions to make this better than it is! Great idea. I'll take one. Wow, this would be awesome. I was building a module and trying to test it. I think I had a cable go bad but at the time, I thought there was something wrong with the module when it was working fine. I also do my own power cables. I'd definitely be interested. I would definitely take one! Handy for me as I'm making a load of my own cables. Looks useful, I'll take one too! Oh yes please, as I am about to start making my own cables. Is the 7805 to power the LEDs? I think you could use 12V directly and just choose appropriate resistor values. 1k should be enough. Yes, I had that before. The problem is that you can't use different voltages then, which was one of my design goals. You would have to change every single resistor then. That's why I changed to using a voltage regulator. So you can for example use your eurorack power one time and then a 9V battery the next time without any problems. Absolutely, that would be great. I'll try to include that if there's enough space. Nice! I'd be interested in one as well. I'd be interested in one too! I just updated it with mounting holes. By the way: if anybody isn't too comfortable with SMD soldering, I could offer boards with pre-installed resistors, too! It's not a big deal for me to solder a few boards for a little extra charge. I would be interested in one with the SMD soldered. That's hard to say right now because it depends on the quantities I'm selling. I'm thinking about something like 7 Eur for a PCB + 3 Eur for soldered resistors. But don't quote me on that later, it may vary a bit. OK, I'm in. I can solder 0805 SMD parts myself if that's an option. I am in for one. This will be useful since I'm building my own cables and doing the power on test hoping no sparks will fly. I'll take a few for sure, my only thought is that making it a little bigger so the headers are further apart... might make it a little quicker in operation, easier to get fingers in there. no big deal though. Cool, I'll take one, that's been on my todo-list for a while I don't mind doing the SMD myself. I can solder 0805 SMD parts myself if that's an option. Sure, soldered resistors are optional of course. Good point. The problem is, when I make the board bigger, it gets a lot more expensive. But it may be worth it, that whole thing is pretty tiny anyway. I will think about that. I thought about placing the LEDs between the headers to have a bigger space between them but that would make it harder to see the LEDs on the other hand. The clearances on your mounting holes are pretty tight, I don't think you'll get standoffs there without shorting out a few components. A good option might be to mirror one IDC header, so it would mate on opposite sides of the board. Thanks for the hint about the mounting hole clearances, I fixed that. Now it has enough space for a standard M3 screw with a 6mm head. I also changed the layout a bit, so that there is more space between the headers. I don't want to have one header on the back, I think it's better if you don't have to turn the board every time you check a cable.